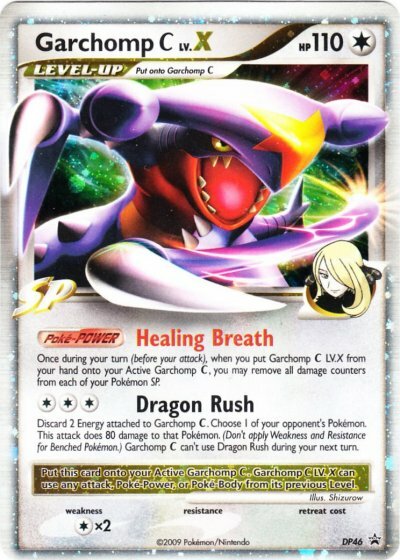 card review Garchomp [C] LV.X: The most feared attacker in the current meta!!!!!! Discard 2 Energy attached to Garchomp C. Choose 1 of your opponent's Pokemon. This attack does 80 damage to that Pokemon. (Don't apply Weakness and Resistance for Benched Pokemon.) Garchomp C can't use Dragon Rush during your next turn. The most feared attacker in the current meta!!!!!! >This card can abuse the SP engine, which automatically makes it fast and disruptive. Along with double colorless energy and energy gain, you can fully load up garchomp c in one turn after discarding the two energy the last turn. > If you don't play SP your best counter is any colorless pokemon that an do more than 60 damage. If you do play SP, consider ambipom G, which will OH KO an opposing garchomp after using dragon rush, or you can use dragonite FB, which will one shot garchomp even with energy. >Disruption, speed....All I can say when it comes to strengths and pros. >Weakness to colorless, and no resistance, Can not ht mew two(resolve this by using dialga G LV.X to counter it.) and can be KOed in one turn by machamp. That's really it. >Artwork, both the promo and pack version of this card have excellent artwork. > I would give this card a 9.9 out of 10. Machamp Mew two, and all colorless pokemon that can hit it in one hit are all part of that 0.1 that is missing. Garchomp [C] Lv. X (Supreme Victors #145/147) is the card you portrayed in the picture. It does not come in a tin. The card that you are probably thinking of is Garchomp [C] Lv. X (Black Star Promo #DP46). Both cards have the same PokéPower and attack, but they are technically two different cards. The review is excellent, nonetheless.